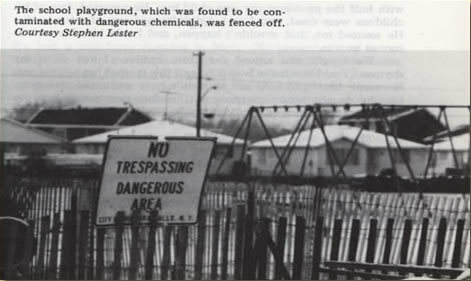 A contaminated playground in the Love Canal site. From: Love Canal, My Story. Albany: State University of New York Press, 1982. Love Canal, My Story. Albany: State University of New York Press, 1982. Lois Gibbs, a mother living with her family in the Love Canal area in Niagara Falls, New York, became concerned in 1978 when she discovered that her son's elementary school had been built over a toxic waste dump containing over 21,800 tons of various chemicals. Her son, Michael, started developing seizures shortly after he started school. When Gibbs was unable to transfer her son to a different school, she petitioned neighbors, and realized many in the community were ill. With her work and national media attention, responsibility over the cleanup of Love Canal became a source of controversy. Love Canal was one of the major environmental disasters that led to the creation of the Superfund Act (1980), which holds polluters responsible for clean-up. Gibbs would continue her environmental work, founding a magazine called Everyone's Backyard, and creating the Center for Health, Environment and Justice (formerly called the Citizen's Clearinghouse for Hazardous Wastes).